The More tab is used to configure how Phone Amego logs calls and other options. Many of the controls have tool tips that appear when you hover over them to explain what the control does in more detail. You can examine your call history in the Call Log window (when logging is enabled). The log defaults to show the current day or last call log saved. Click on any column title to sort by that column. You can select the desired Month and Day to view previous calls, or view an entire Month at a time (by setting the day to All). To view a range of days, press and hold Shift while clicking on the stepper buttons. You can select a group of rows and copy (Cmd-C) as tabular data for pasting into a spreadsheet. To cross search over more than a single month, notice the call logs are plain text (CSV) files indexed by Spotlight. From the Call Log window, press Show in Finder. Then type your search string in the search field at the upper right of the Finder window. The card icon in each row allows you to open the corresponding Phone Amego Contact Card. A card icon with a color background indicates there are previous notes for this caller. You can use the checkbox column to indicate which calls need to be returned, or referenced for billing purposes. You can share a master Call Log with other Phone Amego users by moving the Call Log folder (~/Library/Logs/Phone Amego/) to be inside your Dropbox folder and then creating a Finder alias for it at the original location. To create a Finder alias for a folder inside your Dropbox, press and hold Command and Option while you drag a copy of the folder to the desired location. A similar SMS Log window is available by pressing Option Call Log from the Phone Amego menu. Q: Is there a way to manually enter a call in the Call Log? 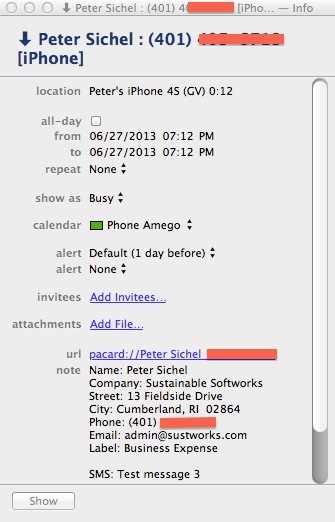 A: From the Call Log window, press Show in Finder. This will reveal a folder containing the call logs with the file for the current date selected. The logs are simple CSV files. You can edit them using a text editor, spreadsheet, or database program like Bento. Back at the call log window, press the refresh button to load any changes. You can log calls in Calendar (formerly iCal) as a separate calendar including the time, caller ID, and recent notes for this caller. By synching your calendar, you can keep a searchable record of your phone calls on your iPhone or iPad. Just type a contacts name or number in the calendar search field to see a record of your conversations. In Mountain Lion (10.8), calendars may be stored locally or in iCloud. You can move them as described here. The Notes field of the calendar item will be populated with identifying information from the matching Apple Contacts record and Phone Amego Contact Card (if any) including the last two call note entries. 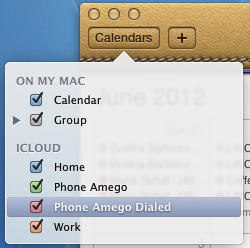 Any notes you take on a Phone Amego Contact Card are automatically transferred to your calendar when the call ends. 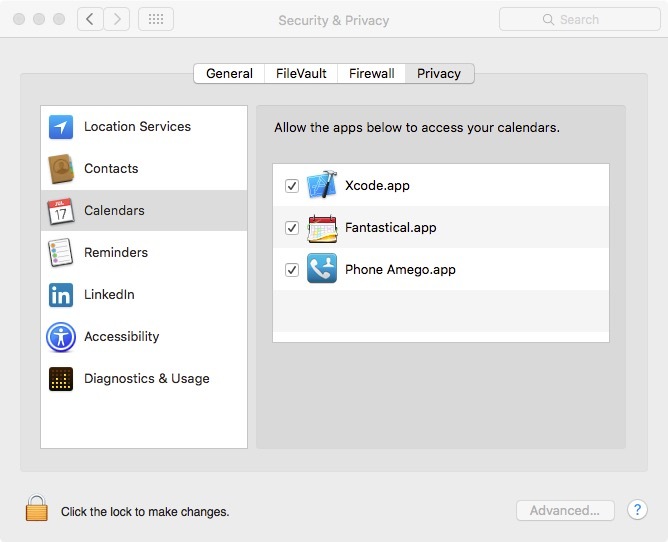 On Yosemite or later, you must allow Phone Amego to access your Calendar under System Preferences > Security & Privacy > Privacy.